Border Window Clean was established by us - Rob and Sheena Jamieson - in the early 1980s. The company was originally formed to complement our contract cleaning business (which we started in 1969) so we could provide window cleaning for our own contract cleaning clients and for other companies too. We sold our cleaning business in 2001 to concentrate on running Border Window Clean. 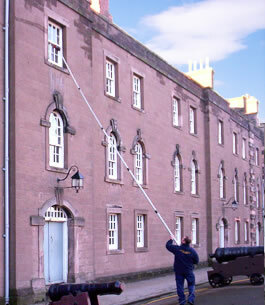 We're now the largest window cleaning company in the Scottish Borders, one of the largest in southern Scotland, and we only use our own full-time window cleaners. 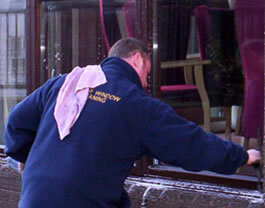 The success of Border Window Clean has been down to the way we work with our customers. It's still a family business - solely owned by Rob & Sheena Jamieson - so it's run on a very personal basis. We have a great reputation for being extremely reliable, we do our job well, we have great employees, and we deal fairly with everyone we do business with. That's why our customers keep coming back year after year. Over the years we've built a very impressive list of prestige customers. Our contract to clean the inside and outside windows for all Scottish Borders Council properties was recently extended for another three years due to the quality of our work over the previous 6 years - although we can't forget our competitive pricing either! Although we've been in business for a long time, we've kept up with modern trends and we've always been willing to test new technology and ideas. We were one of the first companies to adopt the new Reach & Wash water-fed pole system for cleaning windows. This new method made window cleaning much safer for our window cleaners and it introduced cheaper pricing for high-level window cleaning because it was faster, less disruptive in public buildings, and much kinder to the environment. We were also quick to switch to biodegradable and environmentally-friendly cleaning solutions when they became available. If you're looking for a good, friendly, and reliable window cleaning company, with competitive pricing, trained full-time staff, and a great reputation, then please contact us. We'll be delighted to give you a free no-obligation quotation without the hard sell. We have a team of highly professional and experienced window cleaners who are dedicated to providing the very best window cleaning service. All of our vans are fully kitted with Reach & Wash systems, so, wherever our teams are working, we can deal with residential and large commercial projects on the same day which helps to increase our reliability and efficiency when planning work. Provide competitive prices and value for money. Be reliable and turn up when we say we will. Work safely and securely at all times. Be respectful of your premises and grounds. Be flexible to suit your needs. Always use environmentally friendly products. Complete a proper risk assessment for all jobs. Only use full-time staff to carry out your work. Fully insure all the work that we do. Work with the minimum amount of disruption.